Du Prins was established in 1992 by DR du Toit Bsc Agric. (Hons) Horticulture, BInst. Agrar( Hons). Du Prins has developed to a trusted and professional Nursery in Gauteng and it has proven its commitment to the Horticulture industry over the last 24 years. We work to give our clients an edge on their competition. We aim to grow bulk volume and this enables us to fill large orders at competitive prices. We also aim to help smaller landscapers by sourcing and delivering total plant lists in time and on budget to their sites and thus enabling them to concentrate on installation rather than on plant sourcing. Du Prins is situated on the premises of Onderstepoort Veterinary Institute just north of Pretoria with easy access to the N4 platinum highway as well as Zambezi and Voortekkers Road. 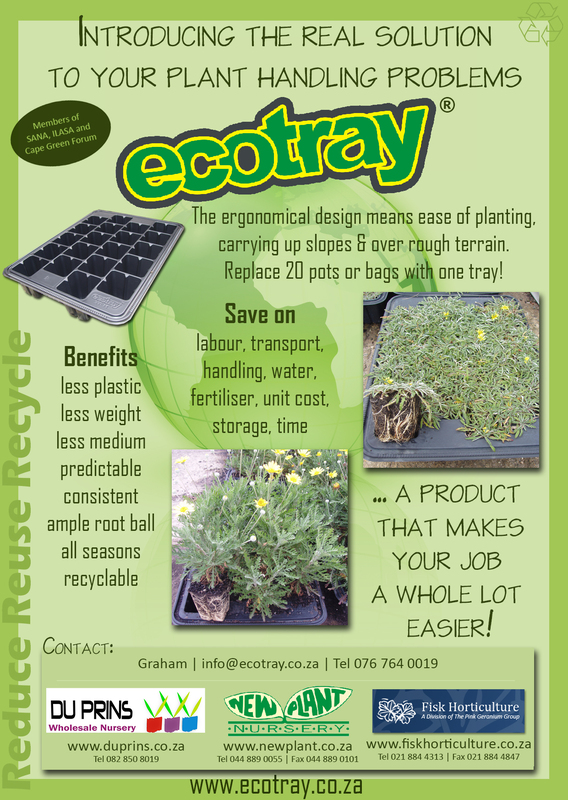 Du Prins is proudly part of the ecotray group, a member of SANA and licenced grower for Ozbreed Australia. If you are not totally satisfied with your purchase, return it to us in its original condition, within 3 days, and we will refund you 100% of the original purchase price no questions ask. Delivery: We work to deliver high quality product to your premises on time.